Shale resources are unevenly distributed worldwide and, for the most part, not located where freshwater is abundant. For example, China, Mexico, and South Africa have some of the largest technically recoverable shale gas resources (based on estimates from the U.S. Energy Information Administration), but face high to extremely high water stress where the shale is located. 15 percent are in locations exposed to high or extremely high drought severity. Furthermore, 386 million people live on the land over these shale plays, and in 40 percent of the shale plays, irrigated agriculture is the largest water user. Thus drilling and hydraulic fracturing often compete with other demands for freshwater, which can result in conflicts with other water users. This is particularly true in areas of high baseline water stress, where over 40 percent of the available water supplies are already being withdrawn for agricultural, municipal, or industrial purposes. The 20 countries with the largest shale gas or tight oil resources that are recoverable using currently available technology are shown in Table ES2 (Download the executive summary here). 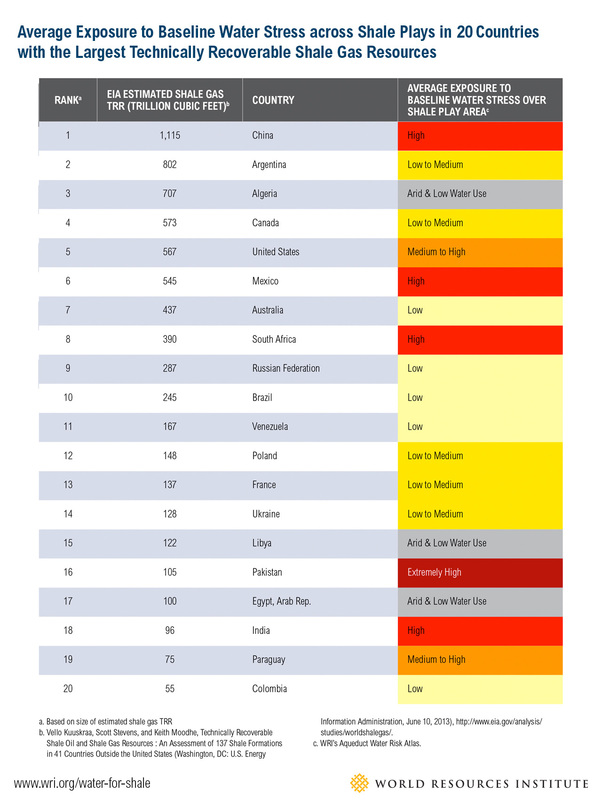 Eight of the top 20 countries with the largest shale gas resources face arid conditions or high to extremely high baseline water stress where the shale resources are located; this includes China, Algeria, Mexico, South Africa, Libya, Pakistan, Egypt, and India. Eight of the top 20 countries with the largest tight oil resources face arid conditions or high to extremely high baseline water stress where the shale resources are located; this includes China, Libya, Mexico, Pakistan, Algeria, Egypt, India, and Mongolia. Hydrological conditions vary spatially and seasonally across shale plays, with variation among plays, within plays, and throughout the year. This variation makes companies’ ability to meet the freshwater demands for hydraulic fracturing and drilling highly unpredictable, and estimates based on previous experience not always accurate in new shale formations. This high level of uncertainty can lead to business risks for companies exploring new areas for development. Furthermore, public concern over increased competition and impacts on freshwater availability can threaten a company’s social license to operate and lead to changes in government regulations that could impact both short- and long-term investments. WRI’s findings indicate that companies developing shale resources internationally are likely to face serious challenges to accessing freshwater in many parts of the world. These challenges highlight a strong business case for strategic company engagement in sustainable water management at local and regional levels. They also point to a need for companies to work with governments and other sectors to minimize environmental impacts and water resources depletion. See all related resources here. Limited availability of freshwater could become a stumbling block for rapid development of shale resources through hydraulic fracturing. Using information from the Aqueduct Water Risk Atlas, WRI provides the first global and country-specific resource to help stakeholders evaluate freshwater availability across shale plays worldwide. Innovation in hydraulic fracturing and horizontal drilling techniques is driving the rapid development of shale resources (which include shale gas, natural gas liquids, and tight oil) across the United States and Canada. Already, known shale deposits worldwide have significantly increased the volume of the world’s natural gas and oil resources. Governments from Argentina and the United Kingdom, to Mexico and China, have started to explore the commercial viability of their shale reserves. The potential for expansion is huge: known shale gas deposits worldwide add 47 percent to the global technically recoverable natural gas resources, and underground stores of tight oil add 11 percent to the world’s technically recoverable oil. But as countries escalate their shale exploration, limited availability of freshwater could become a stumbling block. Extracting shale resources requires large amounts of water for drilling and hydraulic fracturing. In most cases, these demands are met by freshwater, making companies developing shale significant users and managers of water at local and regional levels, often in competition with farms, households, and other industries. Informs companies of potential business risks associated with freshwater availability, and builds the case for corporate water stewardship and early source water assessment. In addition to examining water availability and shale resource development from a global perspective (Figure ES1), this report analyzes for the first time water availability in each shale play (prospective areas within the shale formation where gas and oil could be commercially extracted) for 11 countries: Algeria, Argentina, Australia, Canada, China, Mexico, Poland, Saudi Arabia, South Africa, the United Kingdom, and the United States. WRI selected these countries based on the size of their technically recoverable shale resources (as estimated by the U.S. Energy Information Administration), current exploratory and production activity, likelihood of future development, and feedback from industry, academia, and nongovernmental organization (NGO) experts. Based on the report’s analysis, WRI offers a set of practical recommendations for how governments, businesses, and civil society can continue to evaluate and sustainably manage freshwater availability if shale resources are developed. 1) Conduct water risk assessments to understand local water availability and reduce business risk. 1.1. Companies can evaluate water-related risks. Using a combination of publicly available global and asset-level tools, companies should identify water-related business risks and prioritize areas to engage with regulators, communities, and industry to increase water security. 1.2. Governments can increase investments in collecting and monitoring water supply and demand information. Robust baseline information and estimates of future water supply and demand and environmental conditions can help build a strong, shared knowledge base to inform the development of effective water policies and science-based targets and goals. 2) Increase transparency and engage with local regulators, communities, and industry to minimize uncertainty. 2.1. Companies can increase corporate water disclosure. By disclosing and communicating their water use and management approach, companies can build trust with financial and river basin stakeholders as they investigate water risks and opportunities. Ongoing disclosure will reduce reputational risks. 2.2. Governments and companies can engage with local and regional industry, agriculture, and communities. Companies should closely collaborate with local government, industry, NGOs, and civil society to understand the hydrological conditions and regulatory frameworks within the river basin. This information allows for more accurate estimates of the cost, technology, and processes required to access water for shale development without displacing other users or degrading the environment. 3) Ensure adequate water governance to guarantee water security and reduce regulatory and reputational risks. 3.1. Companies can engage in public water policy. Adequate water governance and environmental protection standards, coupled with predictable implementation and effective enforcement, can minimize environmental degradation and ensure fair water allocation and pricing. A stable regulatory environment allows companies and investors to evaluate long-term opportunities and minimize business risks. 3.2. Governments and companies, through collective action, can develop source water protection and management plans. Governments and businesses in the early stages of developing shale resources have a unique opportunity to work collectively with key river basin stakeholders to develop source water protection and management plans that help reduce business risks; promote a shared water sourcing and recycling infrastructure; and improve the sustainable management of watersheds and aquifers. 4) Minimize freshwater use and engage in corporate water stewardship to reduce impacts on water availability. 4.1. Companies can minimize freshwater use. Using publicly available guidelines, companies can evaluate their potential for using non-freshwater sources and build a business case for investing in technology to recycle or reuse water, use brackish water, or otherwise significantly reduce freshwater withdrawals. 4.2. Companies can develop a water strategy and engage in corporate water stewardship. Companies should embed water management at the core of their business strategy to minimize exposure to risks and ensure long-term water availability for other users, the environment, and their own operations. Corporate water stewardship involves a progression of increasing improvements in water use and impact reductions across internal company operations and the rest of the value chain.